Hop in the time machine and step out into the Ice Age. Primal Megaways will take you way back in time to the Ice Age where the earth had freezing temperatures and was covered with ice. 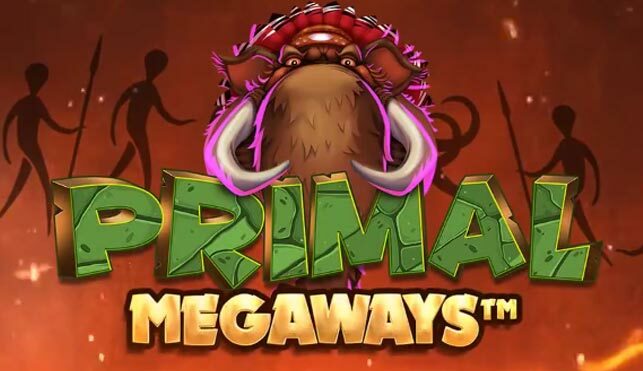 Primal Megaways is a 6 reel, 46, 656 ways to win slot by Blueprint Gaming with an Ice Age theme. This slot features extraordinary graphics with dinosaurs and big woolly mammoths covering the reels. Primal Megaways has an exciting free spins feature which can be retriggered multiple times and a wild multiplier that offers great rewards. With a chance to win up to 50,000x your total stake, Primal Megaways is not a slot you want to miss! Find more on easy slots. Return to the Ice Age in Primal Megaways. Explore the land with caution as you'll be greeted by gigantic woolly mammoths and hungry dinosaurs! A great casino slots games. Primal Megaways is a 6 reel, 46, 656 ways to win slot with an Ice Age theme. The graphics fit the era very well with baron lands and extinct animals. Behind the reels, you'll see large rocks and wild flowers and plants. Symbols include giant woolly mammoths, dinosaurs, tigers, and large paw prints. To form a win, simply land 2 or more matching symbols on any of the megaways. The Wild Symbol - The wild symbol in Primal Megaways is the giant paw print from the tiger. These can only appear on reels 2, 3, 4, 5, and 6. Wilds replace all other symbols on the reel bar the scatter to form winning combinations. The Scatter Symbol - The scatter symbol is the mammoth skull. These can appear anywhere on the reels. Landing 3 scatters will award 10 free spins and x2 or x3 wild multipliers, landing 4 scatters will award 15 free spins and x2, x3 or x4 wild multipliers, and landing 5 scatters will award 20 free spins and x2, x3 or x4 or x5 wild multipliers. Landing 6 scatter symbols offers the best reward of 30 free spins and x2, x3, x4, x5 or x6 wild multipliers. Mystery Symbols - Mystery symbols can appear on the reels at any point during the game. When the reels stop spinning, a common symbol will be revealed. Blueprint Gaming is one of the top UK based online casino operators in the iGaming industry. They create thrilling slots for both global and online mobile markets. Their games are some of the best and they are available to play on over 100, 000 land-based gaming terminals around the world as well as online click to discover more. Primal Megaways is a fantastic online slot and we can see why it's so popular with many other gameplayers. The Megaways mechanic makes the slot more interesting compared to the usual slot setup. The unique theme is a big plus too. There are plenty of chances to form great wins and with every spin, you could win up to £250, 000.